Thank you for giving me the opportunity to speak a few words today. I think this is an important topic which requires debate and discussion in our society and I am very appreciative of CEPA’s initiative in this regard. What I want to do today is to reflect on the current discourse on university education. I think this is important –because I have found that most of our discussions about university education start with many unexamined assumptions. Certain ‘truths’ have become established and worryingly these ‘truths’ are being reproduced endlessly with very little critical reflection. So, with your permission, I am not going to describe ‘current issues’ in university education today; instead, I want to step back a little and reflect on how ‘current issues in university education’ are being constructed. In general, there is a strong sentiment in society that university education in Sri Lanka is in a state of crisis. Many examples are put forward in support of this view: our graduates, especially those graduating with Arts degrees are considered unemployable and of low quality; universities hotbeds of student violence and radical politics; the quality of teaching deplorable and curricula outdated; the quality of research and innovation pathetic etc. In general, universities are considered to be in a mess. Most university academics would add to this list, issues such as the deterioration of academic freedom, university autonomy and the politicisation of university administration. These issues have been debated and discussed but generally, these are accepted as more or less characteristics of the crisis in our universities. Certain standard prescriptions are also offered to manage this crisis: strengthening university-industry relations, modernising curricula to meet the needs of the labour market, public private partnerships, internationalisation, promoting more marketable study programmes, encouraging universities to offer financially sustainable and self-financed study programmes, strengthening ICT, soft skills, English among graduates, expanding science and technology studies while limiting the expansion of the humanities and social sciences. These are some of the major prescriptions that are suggested and often implemented. Both the identification of the crisis or the issues in university education as well as the prescriptions, are offered as ideologically neutral options. However, on close examination, it is apparent that the identification of the crisis as well as the solutions offered emanate from a particular view of society and of education. That is, the belief in the market to provide solutions to all problems including social problems, shutting off other choices or ways of doing or thinking about things and most alarmingly, disconnecting one’s personal experiences of social problems from public and political concerns. So for example, rather than seeing the crisis of universities as a reflection of financial cuts to education, extreme politicisation and severe problems with recruiting and retaining quality faculty, which are largely to do with education policy and political choices made by successive governments, parents and students are encouraged to think that the crisis in university education is to do with bad personal choices: bad choice of study programme, bad choice of friends, bad career choices etc. Or with personal deficits: inadequate English skills, lack of social polish, ignorance of social etiquette. Viewed in this way, education becomes what a student as an individual makes of it. The relationship between the student and the university is also defined in market terms: the student is a client or a consumer of a particular commodity. The university is expected to compete and offer a quality commodity that is economically feasible. Consumers who cannot afford to purchase this commodity can either obtain loans (in turn increasing the pressure on obtaining marketable skills to be able to pay off debts) or to drop out of the system. The logic of demand and supply will essentially regulate the quality of education as well as its quantity. The ideal student today, is one who does not spend too much time on campus and one who does not socialise – instead, the ideal student is one who will spend minimum time on campus, enrol in a couple of professional courses while following an academic programme, stay well away from any kind of social or political activity on campus and who will complete the degree as fast as possible and get out as quickly as she can. And get a job. What we are seeing in higher education is a strong sense that education is something to engage in for purely economic gain. Education is at a personal level to get a job and at a broader, level to be able to contribute to the national economy. The role of the state in education, the role of the university, faculty and administrators are assessed based on this belief. The kind of education that is required to fulfil this kind of vision and the kind of university or faculty that is required to provide this kind of education is however, necessarily narrow. So what is happening in universities today is the reduction of the role of universities and higher education to extremely narrowly defined, primarily economic goals. It is partly from this idea of education for instance, that we see an assault on the humanities and arts disciplines because these are not viewed as economically profitable or useful. Yet at the same time, we bemoan the fact that our graduates lack critical thinking, imagination and creativity, democratic and pluralistic values. In fact, we bemoan the lack of these capacities among our citizens. But these are capacities that are essentially developed by the humanities and arts disciplines. These are capacities that can be developed in a progressive university culture. First we marginalise disciplines that teach such skills and reduce university spaces to a bad imitation of corporate culture, and then we spend time, energy and money trying to figure out how to make our graduates more employable. Of course, there are critical questions to be asked about the quality of humanities and arts disciplines and indeed of all disciplines in our universities and indeed in our schools. There are extremely important questions to ask about the lack of democratic space and pluralistic values in our universities. There are also serious questions to ask about the quality of faculty, students learning experiences, curricula and research culture. But the way in which the problem is currently conceptualised does not allow for these broader questions to be debated and discussed. We have accepted the prescriptions without examining the basis on which these prescriptions are made and indeed whether these prescriptions are effective to deal with the questions with which we are faced. The reforms and strategies that we are suggesting to overcome these problems are stripping education of its transformative and political potential. Instead, we are turning our universities into graduate producing factories while simultaneously complaining about their lack of creativity, imagination and humanistic values. It is for this reason that I think that it’s important for us to first debate and discuss on what we mean by higher education or even education. It is only based on this that we can then identify the issues and problems in our universities and devise ways of addressing them. For example, do we view education simply as means of contributing to economic productivity or meeting the needs of the labour market? Or do we view, education as also having a broader humanistic role, education as something that prepares a person for life, for expanding a person’s mind and heart and contributing to the protection and promotion of democracy? These are essentially ideological and political questions. But, education is at heart a political act: education is about transformation, about change. So education needs to reflect the kind of society we want to be. If we want to have a conformist, authoritarian, narrow-minded society that believes purely in individualism, market fundamentalism and corporatism as its development strategies, the task before us is fairly easy. We simply need to speed up what we are already doing and be a little more efficient about it. We need to stop beating around the bush about free education and our commitment to equality in education etc and simply say that we view education as another commodity that is best managed by market principles. But there is an irony here: societies with strong economies have acknowledged that a humanistic and progressive education system is actually essential for a healthy and dynamic business culture. So in fact, even in the US, there are business educators who are fighting to protect the progressive culture of their universities. The fact, that the business culture in Sri Lanka does not see the importance of strong, vibrant, humanistic universities is a reflection of the state of business in Sri Lanka and its position within the global market. As we are currently positioned economically, we do not require very much more than what we are dishing out currently as education. However, if we want a democratic, pluralist society with adequate mechanisms to ensure social justice, then we need to conceive of education and of our universities differently. We need to acknowledge the public value of universities, the class room as a space of critical pedagogy, and the value of maintaining universities as a space of democratic vitality. We need to consider the relationships between universities and larger society: are they simply to be ivory towers of elitist learning or vital, energetic spaces engaging meaningfully with society, with societal issues at different levels, contributing meaningfully and in fact leading transformation and change in various spheres whether they be economic, political, social or cultural. If this is the vision of society and education we have then we have to seriously rethink our current approach to education not just university education. The capacity for critical examination of oneself and one’s traditions. This includes the capacity to reason something logically and to challenge established traditions and authority instead of merely accepting things at face value or because someone in authority tells us it is true. The ability to see themselves as not simply citizens of some local region or group but as human beings bound to all other human beings by ties of recognition and concern. This is essentially the ability to appreciate diversity and plurality. Thirdly, she identifies the capacity to challenge and expand our narrative imaginations: the capacity to learn what the world looks like from the point of view of others we typically do not see or meet. In other words, to develop a broad imagination that encourages an expanded world view. She states that these capacities are essentially developed by high quality education with substantial components from the arts and humanities. She argues that if we are to maintain a healthy democracy, in fact to ensure the survival and progress of democracy, we need to ensure that these capacities are developed through our education, particularly higher education. So if I were to summarise what are the current issues in university education, I think the problem is that we are confused about what we want from university education and also about our strategies and approaches to university education. As we often do in this country, unfortunately, we are responding to the manifestations of the problems rather than to the root causes of the problems, thereby adding layers of confusion and disarray to an already fragile and vulnerable system. What is dangerous is the lack of space to critically examine the way in which problems in university education are conceptualised and solutions and strategies are proposed. In some ways this had to do with the politicisation of education, where decision making was taking place in politically compromised ways based on the interests of those in power. But it also has to do with the way in which education policy is developed and education reforms are proposed. It is important that the directions we take and indeed are taking are not perceived as ideologically neutral, apolitical decisions or choices. The decisions about the kind of education we wanst are linked very much to the kind of society we want and these are essentially political choices. In this age of neo-liberalism, politics is a dirty word, and we shy away from ideological and political discussions. In fact, we celebrate that we are ‘apolitical’ that we are above politics. What we forget is that, that very position itself is highly political and ideological. But it is important that we recognise that this is not a problem that is unique to Sri Lanka. The kinds of changes that we see in education and higher education in Sri Lanka are happening all over the world. Students and faculty globally are organising themselves to fight back against some of these changes. So we need to see the crisis in education as part of a larger, global issue. That is precisely what is lacking today in the discussions on education – we are failing to see how changes in education are linked to some of these broader debates on democracy, the economy, market fundamentalism and the reduction of the public sphere. Instead, we are seeing it in purely technical terms requiring purely technical solutions. So we organise curriculum revision workshops, send our students on personality development courses, send our teachers for further training and beautify our universities physically. However, it is critical that we see the crisis in education for what it is – one that is embedded in the broader crisis in our political, economic and social structures. It is only then that we will be able to clearly identify the issues that we are facing in university education and perhaps even to respond appropriately. *Dr Harini Amarasuriya, is a lecturer at the Open University of Sri Lanka and was invited to be a panellist at CEPAs 53rd Open Forum. The event looked at how, historically the Sri Lankan university system has enabled social mobility and also at how such ‘enabling’ was conditioned by wider socio-political realities including structures of power and the intersectionality of identity and socio-economic and political statuses. For more information about the event please click here. Why Are We Being Enlisted In 'Save The Party' Projects? There is some support for each of these accusations, but these need to be taken in the context of Sri Lanka, and the evolution of education in Sri Lanka. I would strongly recommend that you take into account, and compare the Education Systems in Germany, Norway, India, Malaysia, Singapore and Taiwan. What can we learn from those education systems? What are they doing right and wrong. The flaws in the in the University Education System, is merely an extension of the Education System. So one cannot be easily solved, in the isolation of the other. German public education makes it possible for qualified kids to study up to university level, regardless of their families’ financial status. Humanity’s Top Ten Problems for the Next 50 years. 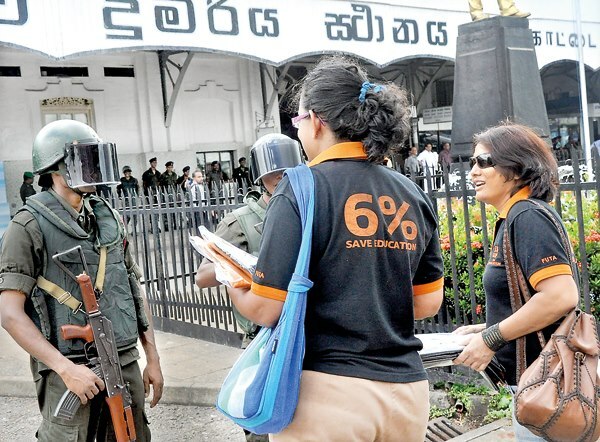 In Sri Lanka, will spending 6% on Education will solve most of the above problems? The order of importance may be different for Sri Lanka. It depends on what kind of Education. If you educate them in Pali, to to Chant and say Pali Bana All day long, you will have a Pali Educated populace, who will perpetuate Pali, and try to get ti Nirvarnna or Nibbana. If you educate them in Arabic, to to Chant and say Quran Bana All day long, you will have a Arabic Educated populace, who will perpetuate Arabic and say Quranic verses all day long trying to get to heaven. These days, the German Education System does not do that. So, the perception value of the Education is different for different people. Have you heard of a Scientific Monk? A scientific Mullah or Ulema? Credit should be given to the Catholic Church for educating the Priests in the Sciences ac well, like Copernicus and Brahe. Not sure when they started teaching priests Copernicus but Galileo was put on trial for espousing Copernican views. Perhaps you are mistaken. Clearly, you are a true-believer so I don’t wish to insult your belief system. But what you wrote is merely advertising copy with perhaps less grounding in fact than you would have us believe. Besides, what’s wrong with Pali or Arabic ? These languages are much older than English or even Latin (tell me, do you say mass in Latin ?) The Pope speaks Italian and Spanish.. dont you think that’s terribly passe when there’s perfectly serviceable English around ? You ask about Scientific Monk ??? or Scientific Mullah ??? I must say, Coming from a guy who belives in virgin birth and world created in 7 days.., that’s a bit rich ! We school our children but do not educate them. Our children compete to get into universities that continue to school them, but calamitously fail to educate them. Our high literacy is the result of schholing to various levels, but do not expand the mind and heart. Education= Knowledge + Culture + Wisdpm. We are schooled to acquire knowledge (accumulation of facts and in equal doses nonsense), including some technical skills. We are yet very rarely permitted to accumulate the wisdom that comes out ofthe marriage of knowledge and culture. We rarely learn of the wisdom passed down from our past- both from the eastern and western streams. We are not taught to think about and relate our knowledge and experinces with something that is profound. Thus our schoolin even at the university level renders us a very profane people. We have lost sight of the fact that the word university is derived from the old French word ‘Universite’ derived from Latin ‘Universitas’ meaning the ‘Whole’- the universal or Universe. A University should produce ‘Wholessome’ humans, who are universal in thinking and the ability to keep p with our past, deal with the present and have a vision of the future. Should we continue to call our higher educational institutions Universities any longer? Should we rename them Technical Colleges and Polytechnics? Can we afford to have real Universities? There are many skilled and knowledgeable men and women amongst us who have not had much schooling and no University education at all. I have found them to be intelligent and capable. Many of them are quite cultured and wise. They are not much different from those who have passed through the portals of our universities, except in mode of dress, lifestyles and expectations! Should University education mean a profound difference in substance? Otherwise how could 300,000 voters vote for Wimal Buruwansa of 2/2 =0 fame, in the Colombo District, the Capital of Sri Lanka? What I think is higher education should be in English medium is Sri lanka, it won’t be a waste of time even if you spend 01 year / first year of all those Uni. students except Medical Faculty for English language only, it will make student life far better, further make all degree programs in English medium only, it will be good omen for all expectations of both students & educationists. English will only serve as means of getting further education ,after graduation. This is happening in countries like India for last 50 years or more. English education will ( if you have any fear) never make any body , Sinhalese or Tamil, anti-Sri Lankan in culture or anti Tamil or Sinhalese. Most of anti-imperialist before 1948 had education in English & went to English universities. So it’s better for both students & Uni teachers to give education in English. Will it change the average IQ of Sri Lankan from 79? Better Nutrition and of course better education and the ability to think will. Root learning won’t do much. Will giving the Education in Chinese, Korean or Japanese change the IQ? I guess Hong Kong & Singapore give education in English only, their IQ is quite okay. What I think is that Students have a bleak future if they don’t get Education in English , because going by Sri Lanka job market & values etc. you are nobody if you cannot speak English well, so Uni. graduates get frustrated seeing less qualified people doing well in our country. Further what further education they get in Sinhala or Tamil ,other than their own culture or religion ? Almost all the informal education is also in English, for ex. Internet , books, magazines. Even countries like Italy now thinks that their higher education should be in English medium. Of course it is access to knowledge, that is best available in English. So, they will have a comparable advantage. So a high IQ student in Sinhala or Tamil have less access to knowledge and a better education than a low IQ student in the English medium. This low IQ English medium student may not be able to do science or engineering, but will have better access to other areas of education and careers than the Sinhala and Tamil medium students. This becomes a national loss because the nation is nor using or employing the best available talent. A Ph.D. in Science or Engineering require an IQ above 125. English medium or not, access to the vast body of literature available in English, or not, low IQs will not cut it. The previous Sri Lanka Parliament has 43% of the MPs failing the GCE OL. 300,000 Colombo voters voted for Wimal Buruwansa, of 2/2 =0 fame. Universities are full of fake professors and jokers. Recheck qualifications and sack fake professors. Without PhD from top 100 Universities, without minimum 20 articles in SCOPUS and ISI journals, without three country visiting professorships, without 10 text books with international publishers, no body appoint as professors. As Sri Lanka government University system failed close all poor public universities and hand over them to private sector. It is a common practise now to join the uni system as an academic if you cannot find a job in the private sector. The UNI system jobs should be based on student demand and when there is no demand for a given field, academics in that fild should be forced to retrain for another job. University system job is a cushy job with no pressure. No English skills required and good money for earned by doing useless external degrees and masters degrees. Also a duty free permit!!! The academics cannot be invited to serve on listed company boards because they cannot contribute . The graduates cannot be found jobs other thn teaching or joining the govt, This is our free education system!!! Complete overhaul is required. 6% allocation alone will not address the above issues.